“Mystery Man” isn’t just the end of The Crown’s second season, it’s the end of an era. This is the last time we’ll see Claire Foy, Matt Smith, and this group of performers before they regenerate into older versions of themselves for the next two seasons. (I’m not sure if any of the supporting players will be sticking around for continuity, but I hope the show at least keeps Pip Torrens as Tommy Lascelles, as I can’t imagine anyone else in the role.) That means this finale is also Peter Morgan’s last chance to say what he needs to say about this era of Queen Elizabeth’s life. Does he do so? Well yes and no. We open with a Philip fitness montage because of course we do. A post-workout injury sends Philip to osteopath Stephen Ward and—potentially—back into a life of sin. A year later, Ward finds himself at the center of the Profumo Affair and the question of Philip’s potential involvement becomes a crisis for the palace and for Elizabeth in particular. And so The Crown is able to rehash the marriage theme that has loosely held this season together. As with “Marionettes,” however, this is an episode driven first and foremost by plot. “Here are some fascinating historical events that happened,” The Crown seems to say. “The times they are a-changin’, isn’t that interesting?” But unfortunately, The Crown’s depiction of the Profumo Affair winds up feeling a bit like a Wikipedia page set to dramatic music. One of the weirder choices in this finale is to devote so much screen time to Harold Macmillan, who hasn’t been more than a minor supporting presence this season. Don’t get me wrong, the scenes with Macmillan grappling with the Profumo crisis are both well written and well acted, as just about everything on The Crown is. But they don’t feel like they’re paying off any earlier setup either. Again, it feels like we get a scene of Macmillan attending the seminal 1960s British satire Beyond The Fringe because Peter Morgan wanted to acknowledge that Beyond The Fringe was a seminal 1960s British satire. Thankfully, the scenes that put Macmillan in conversation with Elizabeth are much stronger because they do feel like they’re paying off something we’re invested in: Elizabeth’s abilities as a political negotiator. Elizabeth’s relationship with her Prime Ministers wasn’t as central to The Crown’s second season as it was to the first (it’s hard for Anthony Eden and Harold Macmillan to compare to Winston Churchill), but this season has done a great job demonstrating how much more confident Elizabeth has become in her role as sovereign. Where she used to have a deferential demeanor with Churchill, she now sees herself as the superior in her relationships with her PMs. She at first refuses to accept Macmillan’s resignation and then chastises him when he uses a health scare as an excuse to retire. Her scene at Macmillan’s hospital bedside is one of my favorites of the entire season and it’s a reminder that when it puts its mind to it, The Crown really does excel at mining compelling drama from Elizabeth’s reserved demeanor. If there’s one thing that defines Elizabeth, it’s her stiff upper lip. As the Profumo Affair threatens to break seemingly every important man in Britain, Elizabeth just keeps on trucking. It’s perhaps unfair that she expects the same of everyone else around her (she refers to Macmillan’s orange-sized benign tumor as an “inconvenience”), but it’s also understandable that she does. After all, she’s expected to quietly soldier through a difficult pregnancy, a crumbling government, and a potentially cheating spouse without losing her resolve. So she has no time for a man who simply gives up when the going gets tough. Elizabeth’s fourth and final pregnancy gets a tiny bit more focus here than her third one did in “Matrimonium.” But where The Crown just offered an entire episode examining Philip as a father, it can’t dredge up the same interest in Elizabeth’s role as a mother. Instead, the context in which The Crown is most interested in exploring Elizabeth is as a wife. Because there’s nothing Margaret loves more than puncturing her sister’s happiness (even after Elizabeth just admitted she’s in the middle of a complicated pregnancy), Margaret suggests that the mystery man photographed at one of Ward’s infamous parties could be Philip himself. The problem is that, once again, The Crown mistakes something that would be understandably shocking for the British public for something that would be shocking to its viewers. This season opened on a detailed depiction of Philip’s non-stop pleasure cruise through the Pacific Ocean, so the idea that he might also have attended a random party in England is truly the least interesting thing in the world to me. Connecting Philip to the Profumo Affair (which likely isn’t a connection that existed in real-life) is a way to tie that historical event into the marriage theme of the season. It also serves as the catalyst that brings the conflict between Elizabeth and Philip to a head... again. Elizabeth and Philip’s confrontation in the Scottish country side is largely a rehash of their fight on the ship in “Lisbon.” Only this time around Elizabeth is a little steelier in her resolve. She’s reached her breaking point and she’s more inclined to say what she means. And the ballerina portrait from “Misadventure”—that small but mighty source of so much marital angst—finally comes back into play. The truly bizarre thing about the emotional climax of “Mystery Man” is that in both structure and performance, it feels like it’s designed to be a scene in which Philip finally acknowledges his mistakes and pledges to do better in the future. In fact, if you were to watch the scene with the volume turned off, I’m pretty sure it would read as a loving and tender apology. When you actually listen to the dialogue, however, Philip doesn’t so much apologize as gaslight his wife into believing that the problems in their marriage were all in her head and he’s actually been a saint all along. Philip claims King George made it clear that Elizabeth is the essence of Philip’s duty and that he would never fail to fulfill that duty. Which would be a lot more impactful if he hadn’t cruelly threatened Elizabeth with divorce over a parenting disagreement IN THE PREVIOUS EPISODE. Philip explains there are two kinds of people in the world, those who seem trustworthy and reliable but turn out to be treacherous and weak (like Harold Macmillan) and those who appear to be complex and difficult but turn out to be dependable (like himself). So don’t worry Elizabeth, even though you have truly the shittiest spouse in the world he technically didn’t cheat on you, I guess? The Philip non-apology scene reflects a major problem with The Crown, which is its tendency to keep things too ambiguous. The show neither wants to commit to the idea that Philip cheated on Elizabeth nor commit to the idea that he didn’t, so it splits the difference and leaves the whole thing in a confusing grey area. Although I’ve had my quibbles with the way The Crown altered the history of the Margaret/Peter Townsend breakup, at least the show made a concrete storytelling choice and stuck to it. The idea that Elizabeth denied Margaret her one true love sits at the heart of their sisterly relationship and has allowed The Crown to tell clear, consistent stories about the two of them. The show’s wishy-washiness over Philip, however, has made it almost impossible for him to feel like a consistent character. I don’t even fully understand where his sudden and complete recommitment to Elizabeth comes from. Removed from the context of the rest of the season, the scene is a complex, gorgeously acted piece of filmmaking. Within the context of the season, however, I have no reason to believe this is going to stick any better than it has any of the other times Elizabeth and Philip reached a truce, even though The Crown clearly wants me to think it will because it plays the scene with genuine pathos. I fear this is one of those reviews where I’ve spent so long pointing out big-picture flaws that it seems like I disliked the episode far more than I actually did. 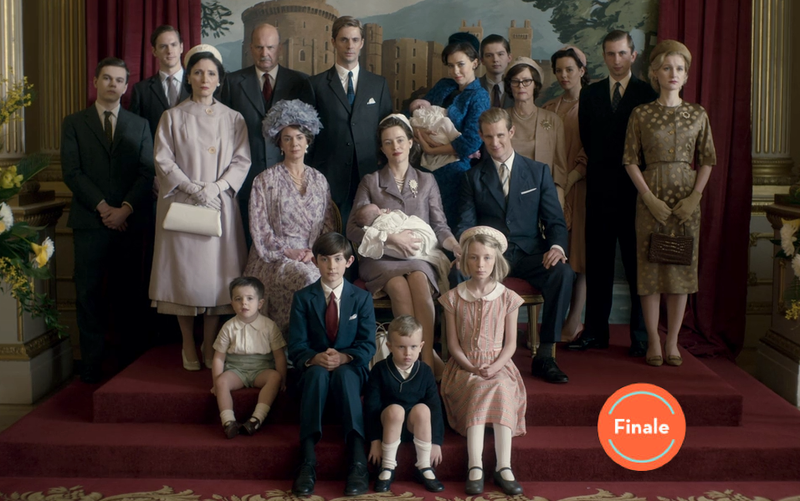 Given the inherent quality level of this series, even the worst episode of The Crown is better than 90 percent of what’s on TV—and this is far from the worst episode of The Crown. It’s just that the most compelling aspects of the episode are the ones that have little to do with the overall narrative and more to do with small moments that are harder to sum up in a review. For instance, watching Claire Foy silently watch Philip look at the ballerina portrait is not only the most compelling moment in The Crown’s entire run, it might also be one of the most compelling TV moments of the year. Looking back, I found The Crown’s second season to be a bit more scattered than its first, which had the parallel paths of Elizabeth and Winston Churchill to anchor it. But I also think season two’s highs were higher and its lows less low. There’s so much to enjoy in this lush, beautifully acted series, and if I’ve been hard on the show it’s only because I know it can stand up to the scrutiny. The season ends with a final family portrait commemorating this era of Crown performers. Philip steps up as head of the household to establish order, and Elizabeth, who had previously been slightly detached from the chaos around her, is more grateful than ever to have her husband by her side. She grabs his hand and smiles. Her family is complete, and as the Queen Mother noted back in “Dear Mrs. Kennedy,” she can now move on to contemplating middle age. Only she’s going to look a little bit different when she does. I have to imagine it’s incredibly disconcerting to have a natural delivery after giving birth three times using twilight sleep (getting used to doing something one way and then being asked to do it differently is always disconcerting). I would’ve loved to watch a whole episode centered around that idea, but, alas, Prince Edward’s birth is dealt with in a brief, largely Philip-centric montage. Not one word of follow-up on Eileen Parker, which is disappointing. And that’s it for The Crown’s second season! Thanks for following along with these reviews and come find me on Twitter so we can gush about how much we’re going to miss Claire Foy and how amazing Olivia Colman is going to be. Oh, and since it ’tis the season and all that, I figured I’d leave us with the real-life Elizabeth’s Christmas speech from this year, which marks the 60th anniversary of her first televised address.